I have a problem. On the one hand, I love looking good in a well-fitting shirt, and on the other, someone up there decided it would be fun to proportion my body in a way that makes it impossible for any normal shirt to fit me. You see, I’m not overly tall, but my arms are super long. Also, I’m a pretty thin guy but my back is more broad than most. If I get a shirt that fits my arms and back, it looks like I’m wearing a tent with a hula hoop for a collar. Getting something that fits my neck and torso means my wrists are naked and any sudden move comes with the danger of ripping the back of my shirt. I’ve read of, and have been told about, the advantages of tailored shirts, but could not justify spending the time and especially the money to ever dream of using that option. That is, until I stumbled upon Epicshirtmakers.com. The guys at Epic Shirtmakers set out with one goal in mind, to integrate their deep understanding and sourcing of quality textiles with their longstanding relationships with master tailors through an online platform. They aim to provide all the customizations and beneficial aspects of custom dress shirts, but with a convenience level that has never been part of the industry. Epic Shirtmakers found that there were essentially two kinds of websites for tailored shirts: The first type was simple and easy to navigate, but the problem was the product was cheaply made and generally something of the quality you could pick up at most department stores. The other type offered great customization and quality but you needed to have a major in computer science, a protractor, and calculator to figure it out, not to mention deep pockets to cover the price. Epic proceeded to create a site with the best of both worlds. Using a combination of over 120 quality materials and the Epic Wizard (more on that later), Epic was able to not only create a fantastic product with the highest quality materials, but also utilize an intuitive and easy-to-use interface to offer great customization. The secret is the Epic Wizard. This system breaks down the design and sizing of the tailored shirt into three effortless stages. Epic Shirtmakers boasts a large selection of quality fabrics to choose from, and it is constantly being updated and added to. At the time of the writing of this article the count was at 123 fabrics including an assortment of different colors in solid, striped, checkered, and herringbone patterns, among others. 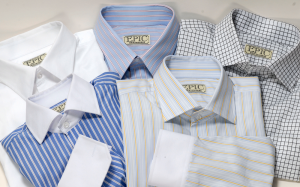 After you have selected your desired fabric from Epic’s impressive assortment, the next step is deciding how you want your shirt to look. This step includes choosing long or short sleeve, the style of cuff, type of collar, the front buttons, back pleats, how you want the bottom to look, the style of pocket (if any), any contrasting on the cuff and/or collar, and monogram options if you choose to have it monogrammed. One of the great features of the Epic Wizard is that while you are going through clicking on your desired options, a rendered model of your shirt updates along with your selected features showing you what the finished product will look like. The last stage in the process is sizing your shirt. Epic gives you two easy methods of sizing your shirt. The Epic Custom Fit will ask you your height, weight, and trouser size. After inputting this information, the guide will ask a series of questions pertaining to your individual preference of how you like your shirts to fit and any possible fitting problems you typically have when getting a good fitting shirt. The second method, The Epic Favorite Fit, asks you some of the same fitting questions, but then asks you to take a few measurements from your favorite fitting shirt for them to use. The step by step process includes pictures showing exactly how and where to take the measurements. The first time you order a shirt, the process may take you a bit to get through. After your first purchase, all of your measurements are saved. From then on, you can simply pick your fabric and style then make a couple of notes in a comment box about any tweaks you would like made to the fit and you’re done. The simplicity, yet highly customizable nature of the system is what really hooked me about this site. I’m a young guy in law school, and while I do enjoy a nice fitting shirt, I barely have time to eat and sleep. Finding a tailor, setting up and appointment, and driving downtown to get fitted are all things I just don’t have time for, and I’m sure I’m not the only one with that problem. Logging on to Epic Shirtmakers and building a shirt from scratch barely takes fifteen minutes. The turnaround time isn’t bad either. The normal turnaround time from order to delivery is two to three weeks. The first shirt may be on the longer side because they have to set up a custom model from your sizing preferences. This time frame is pretty much on par from what I have seen with other tailors. Something not at all like a typical tailor, however, is the price. 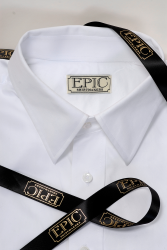 Prices at Epic vary depending on what fabric and styling options you choose (contrast cuffs/collar and monograms will cost you a little extra). As of now the least expensive fabrics are in the $70 -$80 area while the most expensive are around $125. If you look around on sites like Gilt Group and Rue La La you can occasionally find a deal making them even more affordable. Free shipping comes with the purchase of two shirts, and buying four will get you free shipping plus one free shirt. The guys at Epic Shirtmakers set out with the aspiration to replicate the personal experience of getting a shirt tailored to your body without the time and costs associated with going to a tailor. The easy to use format of the Epic Wizard makes it simple to create a shirt to your exact specifications, and the visual rendering of your shirt helps you see what it is going to look like when it arrives at your door few weeks later. Epic’s innovative adoption of an easy-to-use online solution to a process that is largely dominated by specialty shops has been a big hit and inadvertently opened up an entire new audience of young people previously unconsidered to Epic. The intended demographic of people purchasing tailored shirts is typically in the age range of 35-65. The creation of the website and advertizing on sites such as Rue La La and Gilt Group has opened the availability of quality shirts to a younger generation. I, myself, would never have known where to begin to buy a tailored shirt. Possibly the Yellowpages? I think I have a book holding a door open somewhere. But one day while surfing around Gilt Group, I happened upon a deal from Epic and jumped at the chance to get an incredibly affordable, quality shirt. After, getting the product a couple of weeks later, I will never go anywhere else. 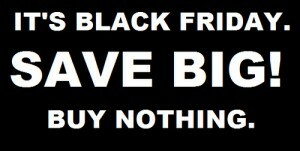 Black Friday is now as much a part of the Thanksgiving celebrations as a big turkey and a huge family get-together. Some people even forgo the latter to ensure their place at the front of the queue for the former. Big-ticket consumer tech has always been the focus of Black Friday and Cyber Monday, and this year was no different. Prices may have been cut substantially – which is the whole point of this weekend intended to kick start the holiday buying season – but they’re still relatively high. Especially when these are products most people want rather than need. This suggests to me that the 99%, that downtrodden section of society camping out to protest the greed of the 1%, is still spending. Even in these tough economic times of austerity measures and massive debts. Techerator produced its own Black Friday Shopping Guide which included products as diverse as cameras, televisions, games consoles, laptops, tablets, and smartphones. All available from a range of retailers at knockdown prices, of course. But despite the obvious price cuts, we’re still talking hundreds of dollars per item here. All of which are being spent on products people desire yet don’t actually need. We’d all love a 46-inch LED HDTV, but how many of us has the $799 in spare cash to buy one on a whim? Cyber Monday is never quite as manic as Black Friday. Mostly because it involved people sitting about in their pajamas ordering stuff from online retails such as Amazon. But the virtual crowds are just as big, if not bigger, than the real crowds which make the news every Black Friday. As a whole, the number of people shopping over the Black Friday/Cyber Monday weekend is estimated to have topped 152 million in the U.S., up 10 percent on last year. I’m not knocking the 99% movement. Hell, I’m one of the 99%. In fact, I’m probably in the bottom 20 percent of the population in terms of income. Suffice to say writing for the Web isn’t the most lucrative career choice, unless your name is Paul Carr (formerly of TechCrunch) or Ben Parr (formerly of Mashable). Am I spending a fortune on Christmas this year? Am I buying televisions for various members of my family? 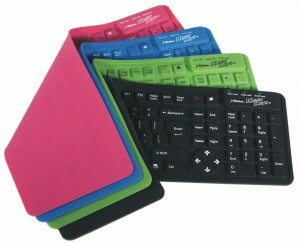 Am I buying gadgets left, right, and center for myself? No, no, and thrice no. Because I cannot afford to. Unlike all those who pushed, pulled, scratched, and bit their way through the crowds on Black Friday, or added a few zeros to their credit card bills on Cyber Monday. The world may be doomed in terms of cash flow, but people will always find money to spend on unnecessary gadgets and gizmos. There’s nothing better than getting a great deal on a new computer or gadget. 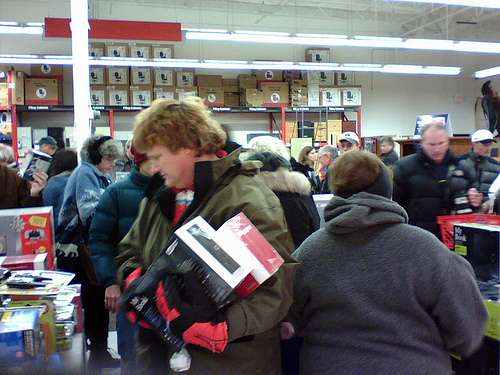 That’s what makes Black Friday such an awesome time of the year for bargain hunters. It’s also just around the corner and I’m sure a lot of you are probably getting an idea of what stores you’re wanting to hit up and such, but do you even know what kind of sales are going on at your favorite stores? We would love to be some assistance to you during your planning phase by highlighting some of the best consumer electronic and gadget deals that retail stores around the country have to offer. 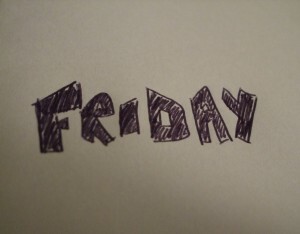 We will be constantly updating this throughout the week all the way up to Black Friday Eve! All phones (except the iPhone) from Verizon, Sprint, and AT&T are on sale for a $0.01 with a new line of service. If you purchase a hotspot-ready smartphone and activate it, you get a $100 Amazon Gift Card.